All SeasonLiquid beneficial bacteria mixes are popular for there ease of use and rapid results. Our best results come from All Season liquid beneficial bacteria because the safe mix contains several strains of naturally occurring beneficial bacteria ideal for breaking down and digesting waste commonly found in pond environments to naturally keep ponds clean, clear and healthy all year long. this highly rated liquid beneficial bacteria additive is ideal for koi ponds, water gardens, fish ponds and lakes. 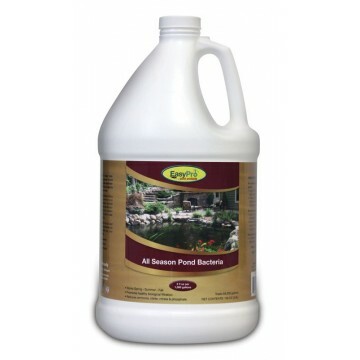 All Season Pond Bacteria contains several strains of naturally occurring beneficial bacteria ideal for breaking down and digesting waste commonly found in pond environments to naturally keep ponds clean, clear and health all year long. Initial Spring Dose or Shock Treatment: Add 2 gallons All Season Liquid Bacteria per 100,000 gallons of pond volume. Maintenance Dose: Add 1 gallon All Season Liquid Bacteria per 100,000 gallons of pond volume. Frequency: Apply every 2 - 4 weeks as needed, Aerated ponds require less All Season Bacteria. Note: Ponds currently on regular bacteria programs or not showing signs of problems may begin with the Maintenance Dose. This is a Green Source product meaning it contains all natural, "green" ingredients that are non-toxic, biodegradeable and eco friendly.